On the 30th of March 2019, with wonderful spring weather, about 1000 people demonstrated near the White House, in Washington DC, for the overcoming and dissolution of NATO. This was the prelude to several protest actions that would take place throughout the week, on the occasion of the NATO’s 70th anniversary and Ministerial Summit. Colorful, feminine, young, diverse and motley was the demonstration, which after a long opening rally (with almost no police presence) started its march through the streets of Washington, passing by central buildings of the war empire and ending at the White House. The core statements of the action appealed to the many tourists that strolled around the DC: disarming for social affairs, protecting the environment and stopping climate change and, naturally, no wars or interventions – “hands-off Venezuela!” and “No to NATO!”. Again and again, the demonstrators’ chants drew attention to the insane character of the US-American President’s armament policy, with the dismissal of the Iran deal and of the INF treaty. Participants and speakers from Europe referred to the issue of European militarization and how it can be linked to the NATO policies, in spite of its independent nature. The demonstration was an expression of international cooperation and of solidarity between peace movements from different parts of the world. On the 1st of April, the “No to war – no to NATO” International Network held its annual meeting. The members of the network used this opportunity to reflect upon the counteractions taking place throughout the week in the DC, and to discuss the counter-summit and the protests planned for December 2019, which will take place in London (UK). 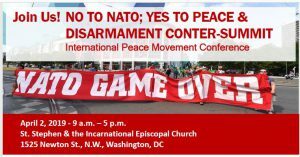 On the following day (2nd of April), the “No to war – no to NATO” Network and several partners from the peace movement organized the “Peace and Disarmament Counter-Summit”, which took place at the St. Stephen & the Incarnation Episcopal Church. Rev. Graylan Hagler (Plymouth Congregational United Church of Christ, Washington), Anna Ochkina (Institute of Globalization & Social Movements, Moscow), Reiner Braun (Co-President of the International Peace Bureau, Berlin), Medea Benjamin (Code Pink, Washington) and Peter Kuznick (Professor of History at the American University, Washington) were among the speakers. A celebration of peace took place on the 3rd of April – the starting date of the NATO’s Ministerial Summit – with the “No to NATO, Yes to Peace Festival”. The event brought people together with music, food, art and speeches from several activists and supporters of the peace movement. The event continued the following day, 4th of April, with a relatively small, but inspiring rally. Protesters gathered in front of the Department of State’s Harry S. Truman Building (venue of the NATO’s Ministerial Summit) and, from there, marched towards the Martin Luther King Memorial. The action honored the memory of Luther King Jr., assassinated 51 years earlier on that date, and with each call for peace his vision lived on: racism, poverty, and militarism – the “three evils” – were denounced again and again. With the upcoming admittance of North Macedonia, the NATO alliance will count with 30 members, and its goal is further expansion. In 1990, there were only 16 member-states in the alliance. Apart from this enlargement in membership, around 15 other states maintain agreements with the NATO, including Colombia and several countries in Asia. In view of the current weakness of peace movements all around the world, development opportunities were intensively discussed and strategies for stronger international networking and for closer cooperation with other social movements were devised. The courageous actions of many peace activists and their energetic commitment against war and nuclear weapons were repeatedly emphasized. These solidary discussions, enriched by a consistent acceptance of diverse opinions, led to clear commonalities. All participants were united in saying no to all nuclear weapons, yes to disarmament and to a comprehensive ban on arms exports, in stressing the urgency of preventing that military expenditures rise towards the goal of 2% of countries’ GDP. NATO should be dissolved or abolished. A system of common and cooperative security is an indispensable (and achievable) goal to be set. Meanwhile, NATO’s Secretary-General, Jens Stoltenberg, and representatives of the alliance’s member-states conducted their activities – that well-known scenario in which armaments and confrontation are favored and fostered. After talks being held between US President Donald Trump and Stoltenberg, the celebrations for the NATO’s 70 years were kick-started with the Ministerial Summit. The allegedly “too low” German military budget has been criticized again and again – the many protests opposing an increase in military expenditure in the country have been making it hard for the German government to move towards the 2% goal, but Trump still insists on a prompt delivery. In March, Stoltenberg had already noted, proudly, that the European NATO states and Canada have increased their military budgets by US$41 billion since 2016, encouraging a further increase US$100 billion by the end of 2020. While Stoltenberg did not mention the US$725 billion in the US budget for armaments and war, he made sure to thank Trump for his active role. He repeatedly pointed out that NATO has been stirringly countering Russian “aggression”. The confrontation with Russia naturally occupied an important spot on the Ministerial Summit’s agenda – a topic that inescapably brings us back to the very roots of the NATO alliance. Currently, it would not be unreasonable to talk of an intensification in this confrontation. In the past four years, NATO alone has invested US$2.3 billion in “military mobility” against Russia. Now, a good quarter of a billion US dollars will pay for a US-American arms stockpile on Polish territory. Mentions of Georgia and Moldova, both involved in internal conflicts, as possible future NATO members serve as further provocations to Russia while violating NATO’s very own statutes. Last but not least, the expansion of NATO activities in the Black Sea has been underway for some time. The war alliance extended the presence of its “Maritime Groups” in the Black Sea from 80 to 120 days in 2018 – and that happened before the 25 November incident in the Strait of Kerch. Participation in maneuvers of up to 20 days – as the Montreux Treaty permits – continued throughout 2019. The active presence of NATO ships (always with German participation) in the area is to be enhanced still further. Immersed in a global culture of fear and violence, one can easily be carried away by twisted facts: the military alliance’s expansion to the East through international agreements and contracts hides behind claims that Russia is “marching towards Berlin”; the development of a comprehensive missile defense system and new military bases by the NATO is eclipsed by allegations that the Russians are already established in Frankfurt Oder (right on the border between Germany and Poland) and Brno (Czech Republic). What a farce – needless to say, however, a very dangerous one. In addition, as concerns around the issue are ever increasing, nuclear weapons could not stay out of the ministers’ agenda. Now that the US has terminated the INF Treaty, the deployment of nuclear medium-range missiles in Europe is, in principle, once again possible. Chances are, however, that a definitive say on further nuclear armament will only come from the summit of the NATO’s Heads of State (and, therefore, with Trump) in December 2019, in London. In spite of the NATO’s continuous growth, defeats faced by the alliance and its members in the past decade (especially in Afghanistan and Syria) have not left it untouched. On top of that, we should not underestimate the impact of peace organizations working across the globe, fiercely facing the current weakness of international peace movement and working, day by day, to delegitimize the NATO and the narrative that sustains it. As a result, in many countries, public opinion has become (even) more critical of the NATO. The “No to war – no to NATO” International Network contributed considerably to this. Withal, we still have a lot to do before NATO can be overcome or dissolved. we cannot fail to address the urgency of re-strengthening the peace movements, both in the US and internationally. Trump’s primitive “America First” policy, accompanied by a nationalistic and militaristic rationale, has certainly contributed to the weakening of the national peace movement in the country. On the other side of the ocean, the logic behind Europe’s “militaristic emancipation” plays a similar role. The several rallies, marches, and events that called for “no wars” in the DC were indisputably beautiful, vibrant and inspiring, but they were still relatively small in attendance, representation, and media coverage. In 2012, as many as 30,000 people took to the streets during the NATO summit in Chicago; before that, in 2009, the 60th anniversary of the military alliance had also been marked with huge demonstrations. Building upon the lessons learned in Washington, we will continue to work tirelessly to globally bolster the struggle for peace. In December, when peace movements from around the world meet to mark the NATO’s Head of States Summit, we are determined to bring to London a renewed sense of purpose and even louder shouts of “no to nukes”, “no to war” and “no to NATO!”. The German government’s posture is mostly ambivalent, with a pinch of cowardice. Everything suggests that the goal is, in the long run, to reach the much-talked-about 2% of the GDP for military purposes. 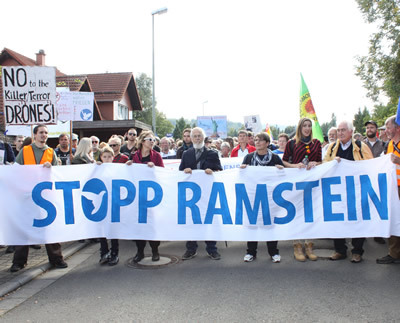 On the other hand, aware of the recurrent protests that illustrate the unpopularity of this policy in the country, these developments are put off by the administration – especially through efforts of Chancellor Angela Merkel and Foreign Minister Heiko Maas. At the end of the day, nevertheless, Germany’s military expenditures in 2017 already amounted to 1.2% of the GDP – a waste of around 40 billion euros. According to a poll conducted by the ARD (German public television), even 48% of CDU – the German conservative party – voters oppose raising military expenditures. Policies for peace, representing change and courage, seem to appeal to the different sectors of German society. If states willing to actively stand for disarmament were to form a broad intergovernmental coalition, decoupling themselves from Trump’s mania for arms, it is possible that the German government would be pushed to finally realizing these policies.